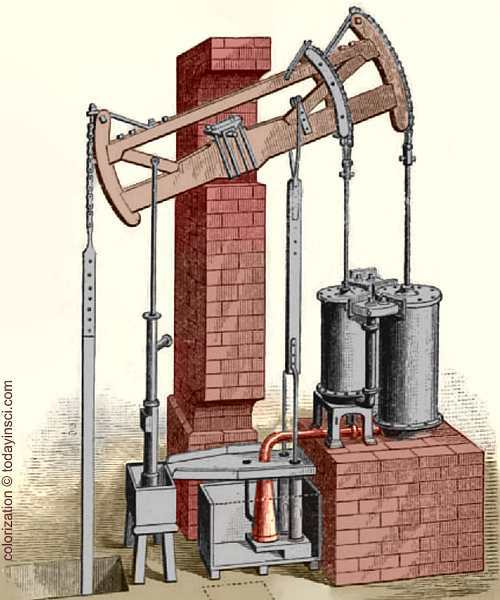 English mining engineer who invented the first compound steam engine. The term “compound” refers to the system of two cylinders, whereby exhaust steam from the first cylinder is fed to a second cylinder to provide additional power. Specification of the patent granted to Mr. Jonathan Hornblower, of Penryn, in the county of Cornwall, plumber and brasier; for his invention of a machine or engine for raising water, or other liquids, and for other purposes, by means of fire and steam. Dated July 13, 1781. — term expired, 1795. NOW KNOW YE, that, in compliance with the said proviso, and in pursuance of the said statute, I, the said Jonathan Hornblower, do hereby declare, that my said invention is described in manner and form following: that is to say, first, I use two vessels in which the steam is to act, and which, in other steam engines, are generally called cylinders. Secondly, I employ the steam, after it has acted in the first vessel, to operate a second time in the other, by permitting it to expand itself, which I do by connecting the vessels together, and forming proper channels and apertures, whereby the steam shall occasionally go in and out of the said vessels. Thirdly, I condense the steam, by causing it to pass in contact with metalline surfaces, while water is applied to the opposite side. Fourthly, to discharge the engine of the water used to condense the steam, I suspend a column of water in a tube or vessel constructed for that purpose on the principles of the barometer; the upper end having open communication with the steam vessels, and the lower end being immersed into a vessel of water. Fifthly, to discharge the air which enters the steam vessels with the condensing water, or otherwise, I introduce it into a separate vessel, whence it is protruded by the admission of steam. Sixthly, that the condensed vapour shall not remain in the steam vessel in which the steam is condensed, I collect it into another vessel, which has open communication with the steam vessels, and the water in the mine, reservoir, or river. Lastly, in cases where the atmosphere is to be employed to act on the piston, I use a piston so constructed as to admit steam round its periphery, and in contact with the sides of the steam vessel, thereby to prevent the external air from passing in between the piston and the sides of the steam vessel. 5 Jul - short biography, births, deaths and events on date of Hornblower's birth. The Most Powerful Idea in the World: A Story of Steam, Industry, and Invention, by William Rosen. - book suggestion. Booklist for Steam Engine History.